Home » For the Garden » Are fabulous looking lawns hard to maintain? Are fabulous looking lawns hard to maintain? 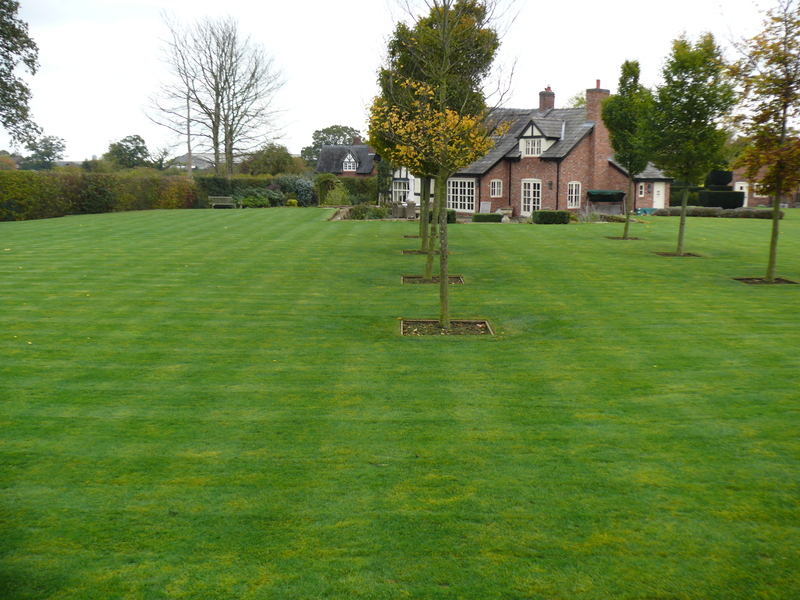 Do you think fabulous looking lawns hard to maintain? 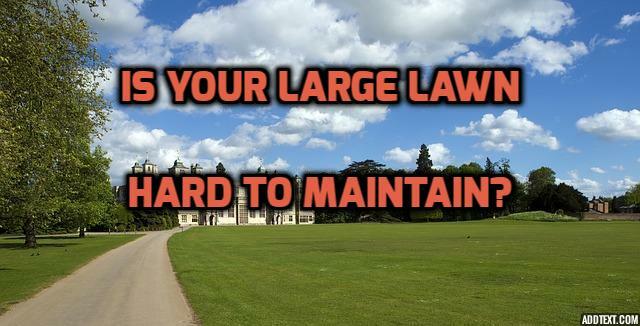 If you live in a property with a decent sized garden, maintenance and ongoing care of the lawn can seem a bit of a nightmare. However, if you take a little time up front to plan for it you will find it easier to manage without taking hours at a time. Lawn mowers now come in a vast range of sizes and can be cordless, electric or gas powered to suit your budget. Riding lawn mowers are a big help with large lawns and if you get the right one with the right parts and accessories, maintenenance can be a doddle. Riding lawn mowers are much less strenuous than mowing by hand and they can provide a better, more professional looking cut. Plus, you can also get attachments that will help you be even more efficient in your mowing. 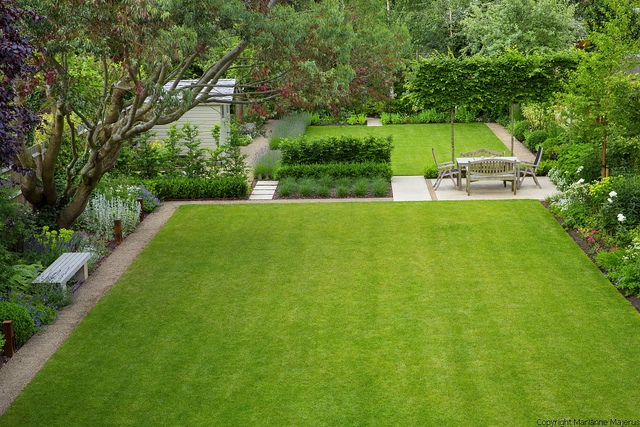 I love the simplicity of this lawn that makes it a relatively simple lawn to manage. 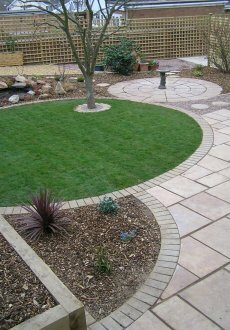 Square in shape with no ornaments to go round, it is ideal for a riding lawn mower and will be done for you in no time at all. Given the size, though, a hand operated mower would do it, it would just take more effort. What wouldn’t you give for a lawn as good as this? But without a decent mower, by the time you had finished mowing, it would be time to start again. This lawn would be a great feature in your property. When you have a round lawn, you have to decide whether to mow round in ever decreasing circles. Or whether to go across and edge it is some way. This small garden is low maintenance in case you don’t have a lot of time. 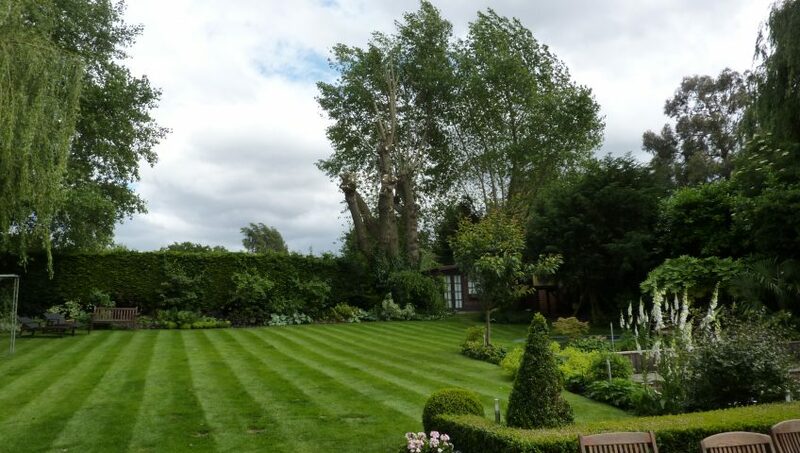 This large lawn has been cleverly combined with trees and shrubs and is strikingly attractive. Trees can add variety to an otherwise monotonous green lawn space, making it more interesting. Trees are also useful in that they provide shade and wind protection and can attract birds into your garden. 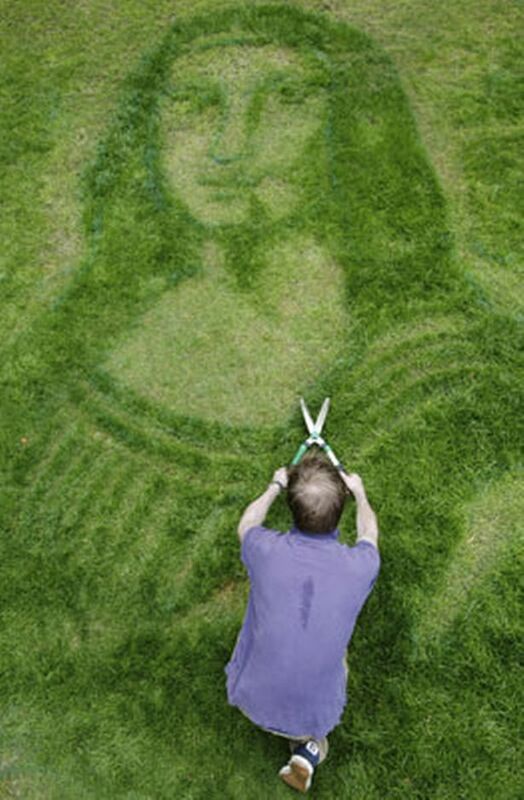 If you fancy a lawn with a difference, why not try cutting it in the design of your favourite pop star, or actor? Or a famous art character like The Mona Lisa in this great picture? If you get it wrong, just cut it a bit lower or let it grow out. It will make your neighbours smile! 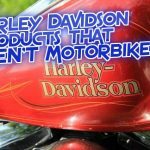 I search the internet to come up with the top 5 things in fun categories to enhance your home, your family, your leisure, and your life in general! I hope you like them and find them useful.